Does mily98 belong in this group? Writer, sometimes worker, proud dad. Rough around the edges. Loves conversation. Good sense of humor. Good heart. Does mallfood belong in this group? Hello to you and yours. We are not socialist because we hate capitalism. 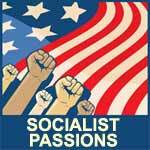 We are socialist because we love people. Our labor and our willingness to work and develop ourselves as people and individuals is what defines us. Does guruv belong in this group? Does nacnudsco1975 belong in this group? Does gundam90 belong in this group? Does bom101 belong in this group? What I find appealing about socialism. Almost everything but like everything it can use some polishing. I would say it's in the right direction to the improvement of the human condition but it won't be the last stop. I think it's the next step in the human advancement. Does bernitek belong in this group? Does ebencooke belong in this group?